Fantastic set up. I'm very happy with my double alpha rig, the builder was easy to use, the holster and mag pouches work great, lot of flexibility in the way you want it set up. Once I got the mag pouches set up for my mags, it was simple! Great rig builder. Easy to use. Good products. Highly revommended. Great and easy tool to build your dream rig, a lot of option ready to go. If you're looking to build a competition rig from scratch, you can't go wrong with CED's rig builder. It's nice that you get a price break using the rig builder than just buying each part or gear individually. The new model holster is smooth, looks great and light. The only thing is if you have a gas pedal like I do, you might get some scratches on the mount from drawing or holstering. The new mag pouches are pretty slick and cool idea how they can be mounted on the ball in different positions. Just make sure you really really really tighten the tension screw that holds the ball to the mag pouch itself. I've had the mag pouches come off when reloading or just straight fall off. The rig builder part was very intuitive in helping me build my USPSA rig for my limited gun. The products are outstanding. I love the new Alpha X holster and mag carriers, build quality is excellent. Lots of adjustability in the holster and mag carriers so I can position them where they feel natural for me. Excellent product. Just as described... great quality and overall look. The tanfoglio mag block wasn’t plug and play for my pistol. It needed some adjustments, but that’s fine. So far I’m very satisfied. Shipping was super fast. Being a newbie and having never purchased a competition rig before, the rig builder from Double Alpha is a great asset. 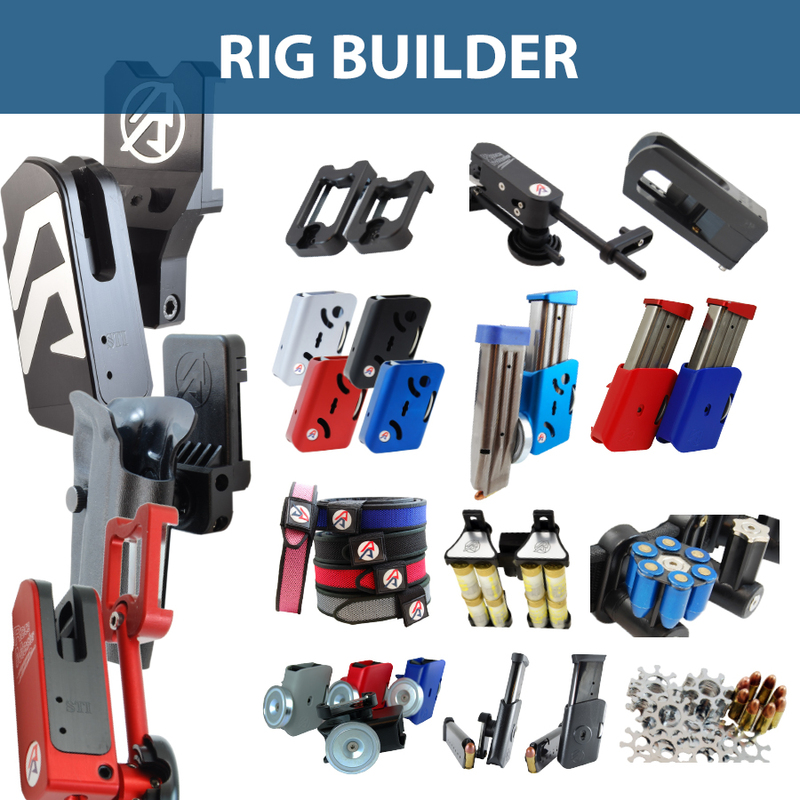 The rig builder systematically takes you through each component, offers you a variety of choices and ensures you have everything you need to compete and enjoy your sport. When the gear arrived I was very pleased with the quality of the materials, design and construction. Knowing that my rig is of premium quality, my weapon is perfect, I only need to worry about developing my skill level. There is a reason why Double Alpha rigs are so widely used, the reviews and videos watched definitely validate the investment. Thanks Double Alpha!! I purchased (2) rigs with the Rig Builder a couple weeks apart. The concept and package discount is great. The only things better are the gear and the customer service! Order #1 was: DAA Premium Belt … awesome, rigid and comfortable, not in love with the keeper. Alpha-X Holster without insert … superb adjustability, quality, fit and finish. Race Master / Alpha-X Insert Block Assembly (Magnetic) for Phoenix Trinity holds my Atlas Titan perfectly Alpha-X/Race Master/Racer Muzzle Support assembly … was not sure about this, chose not to use it daily, but have it as an option. The holster is very secure without it. (3) DAA Race Master Magazine Pouches … superb adjustability, quality, fit and finish. DAA Magnetic Magazine Pouch … way too handy not to have on a limited or open belt! I also snagged a Race Master / Alpha-X Insert Block Assembly (Magnetic) for my Sig P320, as my Atlas had not yet arrived. Works great! Order #2 was: DAA Premium Belt … awesome, rigid and comfortable, not in love with the keeper. PDR PRO-II Holster for STI 2011 ... fits my Atlas Titan very well … had to take a polishing bonnet on a Dremel to smooth an edge to two, but a great setup with awesome adjustability and great retention. (3) DAA Race Master Magazine Pouches … superb adjustability, quality, fit and finish. DAA Magnetic Magazine Pouch … way too handy not to have on a limited or open belt! I absolutely love the gear! The customer service was awesome, as always! Criticisms? Only two and they are very minor! There were two sharp edges on the kydex of the PDR PRO-II, but those were fixed in under 30 seconds with a Dremel and a polishing bonnet. To be honest, I’ve never had a kydex holster that did not require an edge or two to be rounded. My other criticism is also a minor one, and that would be the detached keepers on the belts. Order a couple spares, or snag an Arredondo keeper that resides on the belt. All in all, I’ve owned (1) “multi-holed” rig and these two DAA rigs. DAA is hands down, my favorite. As good as the equipment is, the customer service is what makes DAA my new go to. Great Holster with an even better belt. I was concerned with whether or not it would pop out but it's a solid setup with the Alpha X. This Builder requires one Holster, one Magazine Pouch and a Belt to be activated. Our Rig Builder is a system designed to allow you to build your perfect shooting Rig, to include the holster, belt, pouches and accessories of your choice, to build the ideal rig for you. No longer are you restricted to choosing from pre-defined packages to take advantage of the savings offered on rigs. Now you can build the rig you want, selecting practically any color/type/model combination of pouches and accessories to build up your rig. As you build the rig, the full price of the items chosen is displayed, as well as the discounted price you will be paying.